We offer full service, power and water, power only and non-serviced sites for reservation. Amenities include WiFi access, hiking and biking trails nearby, playground, picnic tables, fire pits, firewood for sale, laundry facilities, free hot showers, and a dump station. Specific campsites are NOT guaranteed. Changes may be made by staff. A non-refundable reservation fee is charged for each individual campsite booking. This reservation fee, plus the first night's camping fee, is payable by MasterCard or VISA at the time of booking to confirm your reservation. A minimum booking of three nights is required for holiday long weekends (Friday, Saturday and Sunday). Reservations will require the reservation fee and the full three night's fees to be paid at the time of booking. 48 HOUR CANCELLATION POLICY. If cancellations are received less than 48 hours in advance of 2:00 PM on the arrival date, the non-refundable reservation fee AND first night's camping fee will NOT be refunded. Reservations with sufficient notice will receive the appropriate refund. No additional charges apply to units with air conditioners, pets, or to use Campground showers. Q: How do you get to the Campground? From Highway 1 eastbound at the first set of traffic lights after crossing the South Saskatchewan River bridge turn right onto 7th Street SW, proceed west for 0.3 km, turn right onto 11th Avenue SW and continue for 1.1 km to the Campground gate. The route is signed. From Highway 1 westbound at the third set of traffic lights in Medicine Hat turn left onto 7th Street SW, proceed west for 0.3 km, turn right onto 11th Avenue SW and continue for 1.1 km to the Campground gate. The route is signed. From Highway 3 eastbound at the first set of traffic lights at the intersection of Highway 3 and 10th Avenue SW turn left onto 10th Avenue SW and proceed north for 0.76 km to a T intersection; turn left onto 7th Street SW, proceed west for 0.15 km and turn right onto 11th Avenue SW to the Campground gate. The route is signed. Q. What is the Campground address? The street address is 402 11 Avenue SW.
Q. Is there a reservation fee? There is a non-refundable reservation fee charged for each individual campsite booking. This fee covers the administrative costs associated with processing reservations. Q. Are tents allowed in the Campground? Tents are allowed in serviced sites but must be on the parking pad. Tents are permitted on the grass in unserviced sites but must be moved every 3 days for irrigation purposes. Q. How many campers/units are allowed per site? Q. Do you have monthly rates? No. The maximum stay at the Campground is 14 days during the busy summer season. Exceptions may be made during the shoulder seasons. Q. How long does your typical camping season run? 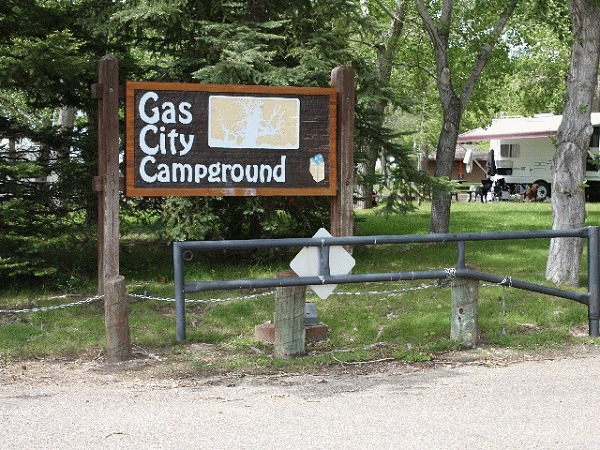 Typically, the Gas City Campground opens in mid-May and remains open through mid-September. Q. How much power is available on sites? The sites serviced with power include 30 amp electrical service. Q. 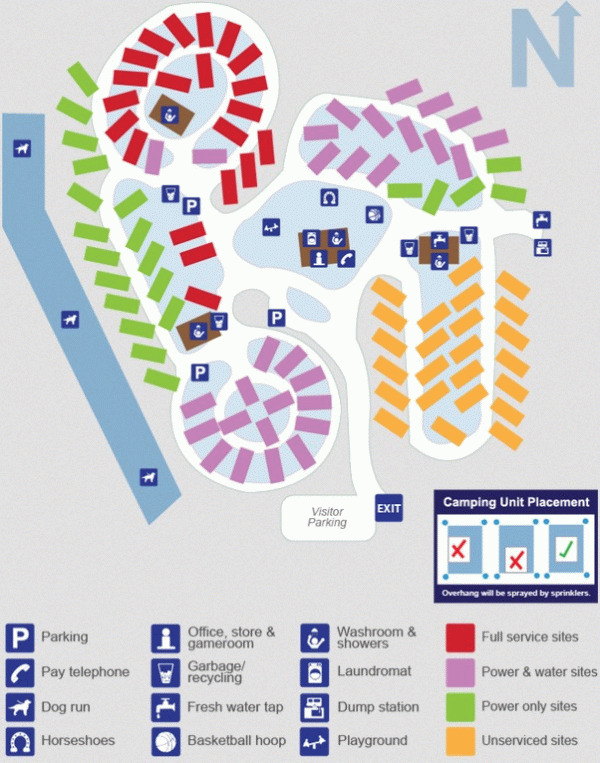 Do you have group camping areas? There is no group camping area at Gas City Campground. Echo Dale Regional Park offers group camping at the far east end shelter area. 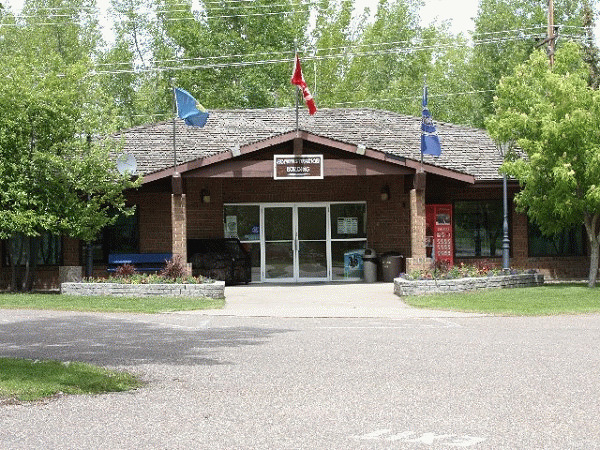 The facility can accommodate up to five self-contained recreational vehicles. This location is available on a reservation basis only. For further information and reservations, please call the Parks and Recreation Department at 403.529.8333. Q. Do you allow an early check-in/ late check-out? Check in time is 2:00 PM; check out time is 11:00 AM. These times provide an opportunity for campers to conclude their previous nights stay and allows those arriving early afternoon to set up and enjoy a relaxed afternoon. Yes, pets are allowed. They must be kept on a leash at all times and owners are responsible for cleaning up after their pets. There is no additional charge for pets. Q. Do you have fire pits and/or sell firewood? Yes, each campsite includes a fire pit. Firewood is available for purchase at the Campground office. Q. Do you have pull thru sites? Yes, the Campground includes a variety of sites, including pull thru sites. Q. Do you have trees / shady spots? Yes, the entire Campground is well treed and all sites offer varying degrees of shade. Gas City Campground offers fire pits, firewood for sale, an on-site convenience store, playground, horseshoe pits, laundromat, free showers, and WiFi. 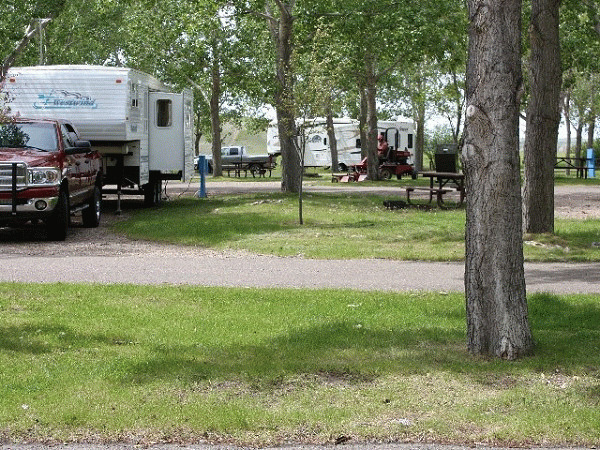 The Campground is also adjacent to the City of Medicine Hat Trail System. Q. Do you have wireless internet? Q. Do you have showers and what is the cost? Yes, there is no additional charge for the use of showers. Q. Do you have a dumping station and what is the cost? Yes, there is no additional charge for registered campers using the on-site dump station. Q. What is the quiet time? Q. Do you have a Laundromat? Yes, there is a laundromat on site. The options include: basic (unserviced) sites; power; power and water; power, water and sewer. In addition, there is an overflow area to accommodate additional units during peak periods such as special events. Please visit Gas City Campground Website.